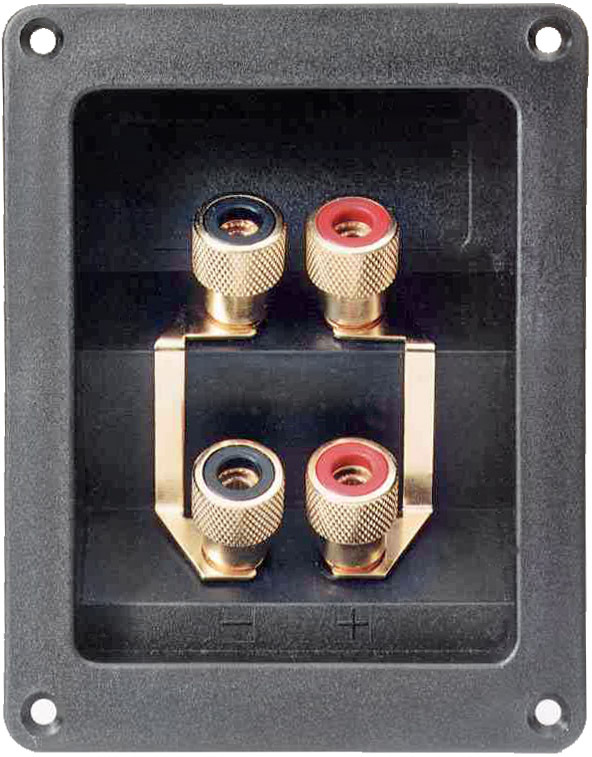 We make a number of solid brass, gold plated terminals intended for use in Hi-Fi speaker applications. Our TP6CS teminal is available mounted in our HFRP01 Hi-Fi plate. Optionally supplied complete with two gold plated bi-amp strips, this assembly is designed for ease of mounting a crossover network. Subject to quantity, we will supply it with a premounted crossover to your design. Mounting plates packed 50, 100 or 200 per carton. Weight with bi-amps is 13Kg. per 100. HiFi Terminal Plate (opens in a new window). CL2150 Hi-Fi recess plate HFRP01 without bi-amp strips. CL2151 Hi-Fi recess plate HFRP01 with two bi-amp strips. Solid brass, gold plated terminals. Crossover can be mounted at the rear. Vertical or horizontal. Versatile rear tag for PC mounting or ¼″ push on receptacle. Choice of terminals - insulated, touchproof etc. The Cliff™ SRP2A is designed to accommodate a wide variety of input and output connectors. The basic version includes a pair of holes on 19.05mm centres centers which allow the fitting of a pair of insulated terminal posts such as our TPP3, 4 or 5. Alternatively non-insulated posts such as our TP6ML can be used. Our PC mounting terminals can plug straight into a PCB mounted on the rear. The mounting distance is 24mm so any suitable PCB mounting components can be used. Where more than one pair of terminal posts is required, another pair may be mounted in the moulded molded locations. Additional holes may be drilled, punched or, if quantities are large enough, moulded molded in. It is possible to fit jack sockets, XLR, CliffCon or RCA phono connectors with, or in place of terminals. For smaller quantities the plate could be drilled or punched. 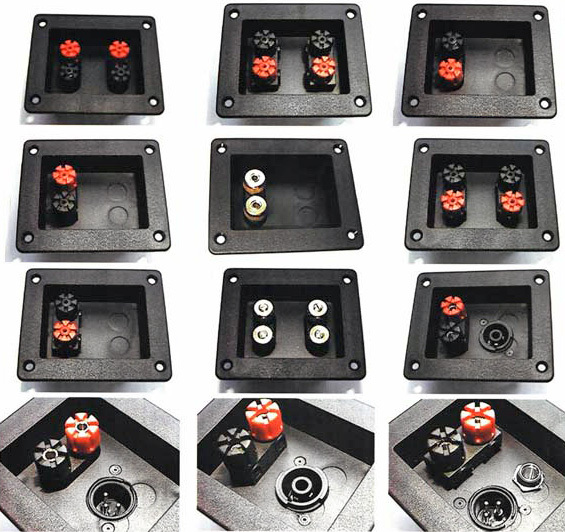 For large quantities, mould mold tool inserts can be made to provide mounted holes to suit various connectors. Text may be moulded molded into the mounting surface with suitable tooling. Alternatively the surface may be printed. SRP2A Mounting Plate (opens in a new window). Plate with a pair of TPP3 mounted, (PC or non-PC type). Plate with a pair of TPP4 mounted, (PC or non-PC type). Plate with a pair of TPP5 mounted, (PC or non-PC type). Plate with a pair of TPP6ML mounted, (non-PC type is standard).